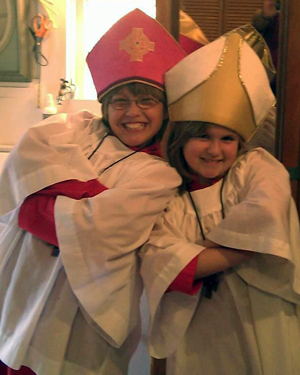 My greatest joy serving in the office and role of bishop is to bring children deeper into our worship. What I find, more often than not, is they will teach me, long before I can teach them. This is a paraphrase, I know, and I apologize for it, with direct apologies to Gretchen Wolff Pritchard whom I am trying to quote, from her awesome book, Offering the Gospel to Children. 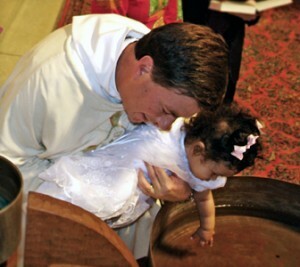 She speaks of the way we tend to bring children into our rituals, whether it be the Eucharist or Baptism, or I would say even into the sacristy, and the way we prepare for communal worship and prayer. Pritchard basically says we have this all backward. What we tend to do with our children, instead of letting them experience these things while they are young and innovative and curious, is wait — we wait, long enough for them to be as screwed up as we are. I write today with a focus on those wonderful saints we call the altar guild, hoping you will do all you can to bring the children into the preparation, the prayerful practice that is your gift to the life of the Church. The days I have felt like I have truly worshipped are days marked by the children who have blown me away by their desire to be a part of what they often only get to sit and watch. I think of Sam who, though only five, reverently watched the crucifer bring in the cross each Sunday. He finally told his grandparents, “I want to do that.” They told him, “someday you can.” But this was not good enough for Sam. 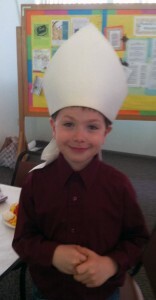 He said to them, “I want to do it now.” He was patient but unyielding and asked every week until finally the grandparents asked the priest what they might do or say to him. The wise priest said, “How about “Yes!” When I came on my visitation, the priest “warned” me, since one never knows how the bishop might feel. I heard Phoebe Griswold once say that she always believed the cross being carried in the procession was one of the bravest acts she had ever witnessed. Yes, that is right. And here was Sam, at the ripe old age of five, knowing exactly what she meant by that, and showing the rest of us. 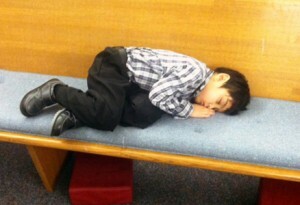 I think of a similar little boy at another parish, who, somewhere along the way, exclaimed that he would like to hold the book for the priest to read the Gospel. So days before we arrived, the priest “warned” the Archdeacon and me that this is what they do now and, in order for this little boy to do his job, and do it on his own, the reader of the Gospel would have to sit in a chair. It sounded very cute. And then the Archdeacon and I arrived. We met this earnest and joyful young man, and the Archdeacon followed him down the aisle at the time for the Gospel, the chair was regally brought out by the one assigned to do so, and the Archdeacon sat down for the reading. Back at the pulpit, where I was, I could hear, quite distinctly, the choked up Archdeacon doing all she could to read the Gospel through her tears, and I could barely see what was going on through mine. I cannot remember my sermon that day, but the first words out of my mouth, which had not been planned until that moment, were, “Do you all in this place realize how blessed you are to witness that every week?” Of course, they did. 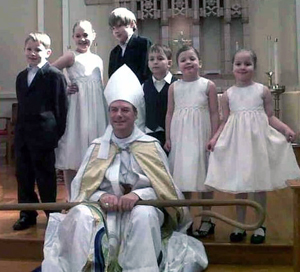 I think of the many times that I have served with children surrounding me, who have been dutifully warned, by parent and priest alike, to “be on your best behavior, you are serving with your bishop.” Just the look on their faces can be so demoralizing to me, as they trudge through their tasks simply trying not to embarrass their family, their priest, themselves. My goal always is to get them to smile. It has become a bit of a joke in this diocese that I love the asperges. I love slinging baptismal water, and lots of it, reminding everyone of their own baptisms. This is often where I finally get the smiles, when I turn to the acolyte serving with me, who by now has almost fallen asleep standing up, and say, “Please put your candles down, hand them to someone, anyone, grab this bowl of water, and this branch, and let them have it! Let these people feel this water and remember their baptism and all they are called to in it.” Then I get the smiles, and perhaps a memory buried in their minds and hearts, of a place, a time, a people, who decided they were more than mere children, but were indeed cherished and important workers in the Kingdom of God, wise enough indeed, called to be our teachers. Behind every one of these stories is an adult, clergy or lay, who had the wisdom to say “Yes,” the openness to break convention, the audacity to take the Gospel at its word: Let the little children come to me, do not hinder them (Luke 18:16). It is not our job to stand in the way but, as Jesus told us, just the opposite. As altar guild members there is so much you could share, inspire and teach our children about our preparations for prayer. The most amazing thing about that extra effort is that you will learn lessons you have never imagined — you will be inspired and taught, too. And, you will help a new generation discover their place in this Body, the Body of Christ. Look for those moments, open the door, let them come.